Fuyuki finds Keroro watching a soccer match on TV and very much into it. 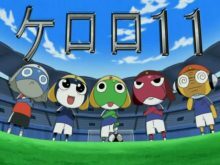 As such, Keroro gets the platoon to Nishizawa’s private soccer stadium where they quickly show they have massive skills at the game. Because they are only four plus Dororo, Dororo is tasked with using his Ninja cloning skill to fill out the remaining members. Proud of what they’ve done, they are surprised when Paul arrives with a hand-picked team of the world’s best soccer players. Paul challenges Keroro to face his team, named Paul Japan. Keroro accepts and the game is on in one week, in which the platoon train hard. On the day of the game, the platoon discovers the humans are able to counter their special moves, but then the humans can’t score either. Its the second half and Keroro decides to use his ultimate move. 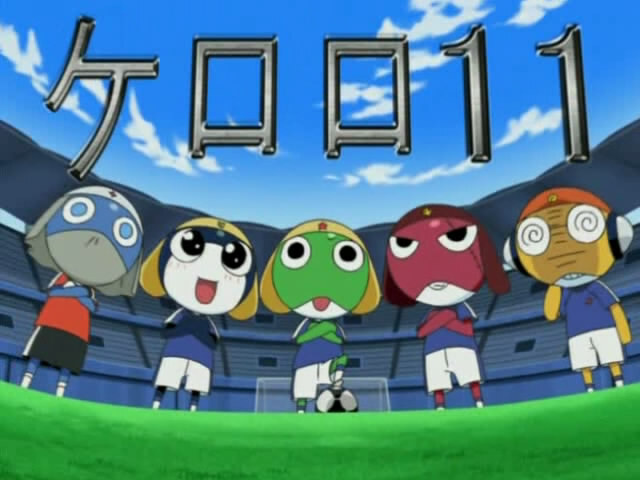 Instead of kicking the ball with the corner kick, Keroro punches it and accidentally scores a goal for Paul Japan. Having lost the game, Keroro is punished by being denied Gundam models for a week. 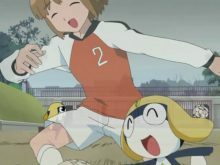 Tamama is running through the neighborhood and discovers an elementary school boy training alone with an old soccer ball. Tamama turns on his anti-barrier and decides to help the boy, but the barrier gets damaged and the boy can see Tamama. However, since Tamama has declared himself a god, the boy goes along with it. Tamama teaches the boy his ultimate Jealousy Shot, which accidentally destroys the ball in the process. Calling it a day, Tamama promises the boy to return the following day with another ball. However, the following day sees the field covered with snow and no boy (Tamama having had Paul’s people repair the ball). Days pass and no boy shows up. Dororo arrives and points to the now-revealed message on the field. The boy had moved away. Dororo takes Tamama to the boy’s new school, where they are practicing soccer. When the boy kicks the ball into the nearby woods, Tamama returns the old ball. Realizing the “god” has returned, the boy has confidence and when he returns to the field, he uses the Jealousy Shot to score a goal. Tamama is happy at first, but not so happy when he doesn’t get all the credit and praise, forcing Dororo to evacuate them both lest they be seen. The story with the boy was also from the manga, but I don’t remember that much about it. Overall, not much for me to say, which is a reoccurring theme for my episode reviews of this series. « A Sneak Peak at "Sasami"